The Blues Bytes reviewers pick their Top Ten lists in this month's Pick Hit section. 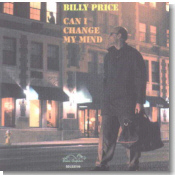 The East Coast's soul secret might be out in the open as soon as the rest of the world gets to hear Billy Price's new CD, Can I Change My Mind, our Surprise of the month. The year's Top Ten re-issues are listed in this month's Flashback section. This month's What's New section features reviews of new CDs from Hungary's Blues Fools, Ross William Perry, Johnnie Taylor, Jo Jo Benson, Steve Freund, Johnny Sansone and others.